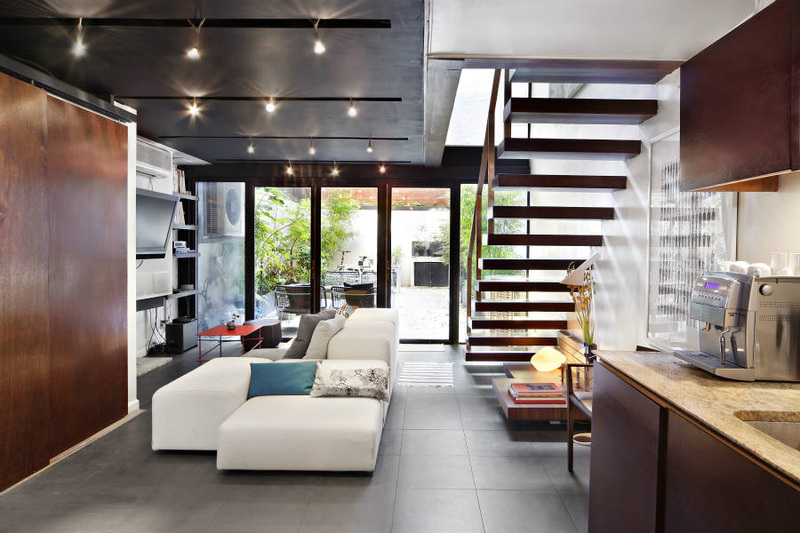 This project includes the re-modeling of a small townhouse in the heart of Soho. The design blends spaces together in an instrumental and seamless way, where boundaries between inside and outside, public and private are being blurred. The kitchen and living space on the lower level connect with a series of glass doors to the garden. A storage area is concealed behind sliding doors and integrated millwork. At the upper level the bedroom is cantilevered nearly 10’ from the building into the garden, creating a sensation of floating in the garden while lying in bed. The use of black metal, Brazilian rosewood and marble creates an integrated atmosphere of warmth and comfort.